On one of my many explorations in New York City thus far, I came across a store that I cannot stop raving about to my friends! 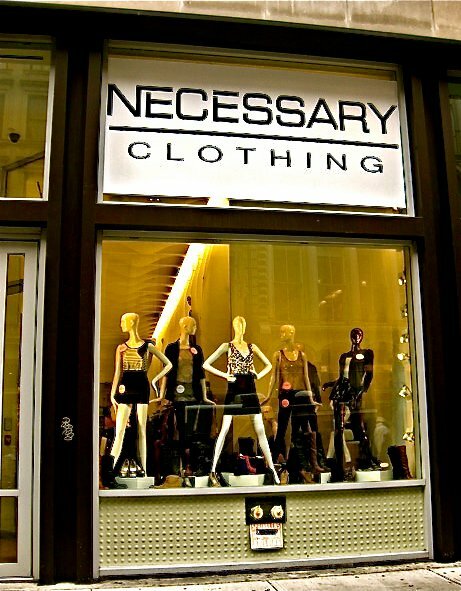 Necessary Clothing has several locations but our initial introduction to each other happened at the Soho location. I was strolling down the street with my iPod on, minding my own business, until window displays were calling out to me. I was instantly in awe of everything I saw in the window. Not to mention, the price tags attached to the articles of clothing were WICKED cheap! I had to go in to see what this was about. I loved literally everything in the store. They style is so Kourtney Kardashian! Everything is so blouse-y, colourful, chic, and CHEAP! It can be hard to find clothes that fit me well because I have such an unfortunately petite frame but crazy curves, but the clothing here fit great! (at least on the top ;) Everything is priced so reasonably - actually better than reasonably. I am so happy that this store isn't nearly as mainstream as H&M or Forever21 otherwise it would totally lose its touch and charm. This is totally going to become my new go to store if I need an emergency outfit or something! MUST COME HERE if you are into blouses and blazers!